Hug from a Hop. Craft Beer lovers bracelet. Leather cuff. 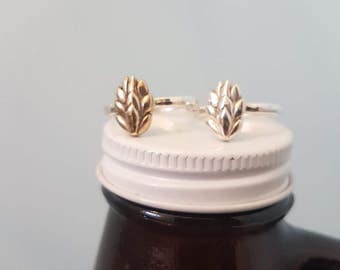 I ordered the rose gold hop earrings for my wife for Valentines Day. They arrived quickly and my wife loves them! Cutting sprues off our large hop pendant. Hand hammering texture with my Raven Custom ball peen. My jewellers bench, it was handmade by a friend apprenticing as a carpenter. Many things in life are pricey. Few are truly worth a pretty penny. Enter spirited independent artist Hilary Pennie. Hand-crafted, heartfelt and of virtuous purity, the artisanal adornments created by her Pretty Pennie Jewellery showcase the ultimate in eponymous craftsmanship. 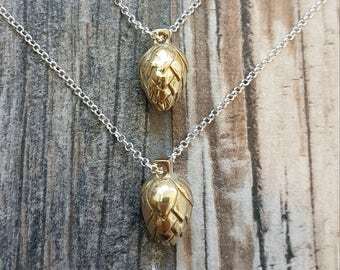 Forged in her Cambridge, Ontario home circa 2016 yet operating since 2009, Pretty Pennie Jewellery is a fresh face in the world of enterprising, individualistic accoutrements created for unique personalities. Homespun by the 38-year-old mother of two and featuring a variety of custom items created in tandem with clients as well as an array of life-inspired, genre-adoring lines including her Pretty Hoppy beer-enthusiast works and axe-throwing culture Pretty Sharp pieces, Pennie's dedication to down-to-earth realism and fostering self-expressive diversity are as inherent as they are beautiful. Moreover, straight-shooting Pennie brings her creations to life utilizing a multitude of techniques from wax carving to hand-hammering, cutting, antiquing, and polishing. Eschewing mass production or outsourcing to cut costs and embracing eco-friendly refining and recycling, quality is the epitome of Pretty Pennie Jewellery. A true artist, Pennie finds inspiration in everything from personal experience to customer interaction and all points in between. Only serving to bolster her abilities, her certification in Jewellery Art & Design from Vancouver Community College created a strong foundation on which her skills and assets have most certainly blossomed. I am an art junkie but manipulating metal with my hands is my biggest passion. My love for craft beer and the great outdoors is reflected in my most recent collections: "Pretty Hoppy" & "Pretty Sharp". Go on and check them out! 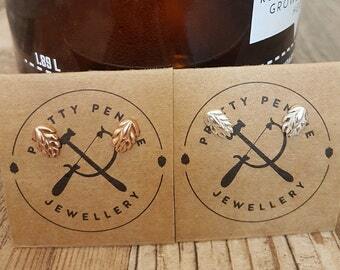 I hand make all jewellery sold at Pretty Pennie, care for your jewellery and it should last a lifetime. Should you purchase gold plated jewellery keep in mind it is plated and this will wear off eventually: Follow your care card and you should be able to lengthen its luster. Payment must be received within 5 days of etsy purchase, otherwise item will be put back on etsy for sale. With Canada Posts recent strike I have moved to Fed Ex for all shipping from now until xmas. 2-3 day delivery. I want to ensure your presents arrive on time. Please be advised this does come at a slightly higher delivery rate. Tracking will be sent upon shipping. Please look into your government policies with brining product into your country to prevent any unwanted charges to be added to your order. Custom orders are welcome, I love to hear your ideas and bring some new fresh ideas to my bench, feel free to message me!